Strengths: Kukuk has an athletic frame that can add more weight as he matures, especially in his lower half. He generates easy velocity via an efficient and loose delivery, with mechanics that don’t put a lot of stress on his body. The left-hander’s fastball sits 91-93 mph, showing late, arm-side tail and downward finish. Kukuk’s heater has bat-missing ability and deception in the release causes it to jump on opposing hitters. The 19-year-old also features an 81-83 mph slider, which he shows the feel to snap off with tight rotation and tilt. This offering has the potential to develop more bite as Kukuk becomes consistent staying on top of the ball. Given the loose nature of his delivery and overall stuff, the lefty has the package to progress as a starter. There’s plenty of room for growth as the experience level builds and Kukuk learns how to master the consistency of his release point. Strengths: Ramirez is an intelligent pitcher on the mound who has a firm understanding of how he needs to execute his craft. The right-hander also does a good job staying level regardless of the situation. Ramirez’s best pitch is an 81-84 mph changeup, with strong depth and finish. The change can show bottom-dropping action or arm-side fade depending on how much the pitcher turns it over. Ramirez is extremely deceptive when throwing the pitch, seamlessly matching both the arm speed and release point from which he throws his fastball. The offering presently grades as solid-average to plus and has bat-missing ability. Overall, the 23-year-old has solid-average command of the entire arsenal. His smooth, efficient delivery allows him to effectively finish his pitches, and throw a lot of strikes in the process. Ramirez effectively pounds the strike zone with his fastball, while also demonstrating the ability to drop the change in for a strike to keep hitters guessing. According to Jerry Crasnick of ESPN.com, the Red Sox have agreed to terms on a minor league deal with pitcher Ryan Rowland-Smith. The left-hander last pitched in the majors in 2010. Rowland-Smith, 30, was signed as an amateur free agent in 2000 by the Seattle Mariners, the only club with which he has seen major-league action. In 115 games with the team, he compiled a 12-17 record with a 4.57 ERA, replete with a 5.5 K/9 and a 3.6 BB/9. Per Matt Eddy of Baseball America, the Red Sox have agreed to a minor league deal with left-handed pitcher Matt Maloney. Maloney, 29, pitched for the Minnesota organization in 2012 before undergoing Tommy John surgery on July 17. He split time between the major league squad, where he made nine relief appearances allowing 10 runs on 17 hits in 11 innings, and Triple-A Rochester. Given that he is still recovering from surgery, Maloney will almost certainly begin the season in extended spring training. 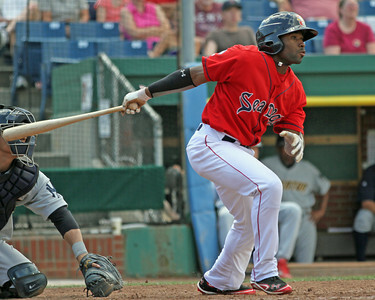 The Pawtucket Red Sox have named Jeff Levering to the broadcast team for the 2013 season, the team announced Wednesday. Levering, 29, spent the last three seasons broadcasting for the Double-A affiliate of the St. Louis Cardinals in Springfield, Mo. He will replace Aaron Goldsmith, who was named the radio announcer for the Seattle Mariners in January, as the voice of the PawSox for the team's 12-station radio network. Before joining the Springfield Cardinals, Levering spent three years as the Director of Broadcasting and Media Relations for the Rancho Cucamonga Quakes, the High A affiliate of the Los Angeles Angels of Anaheim. He also worked as a reporter, associate producer and production assistant for Fox Sports West/Prime Ticket in Los Angeles. Due to popular demand the Fort Report is back this year. This column will appear every Friday during spring training, filled with Red Sox minor league news and notes from Fort Myers. Once again, members of our staff are planning on heading down to Fenway South this March 15-25 and will provide first hand scouting reports, news, notes, and interviews. Today is the first day of full squad workouts but most players reported several days ago, including pitchers and catchers who were required to report by Monday. 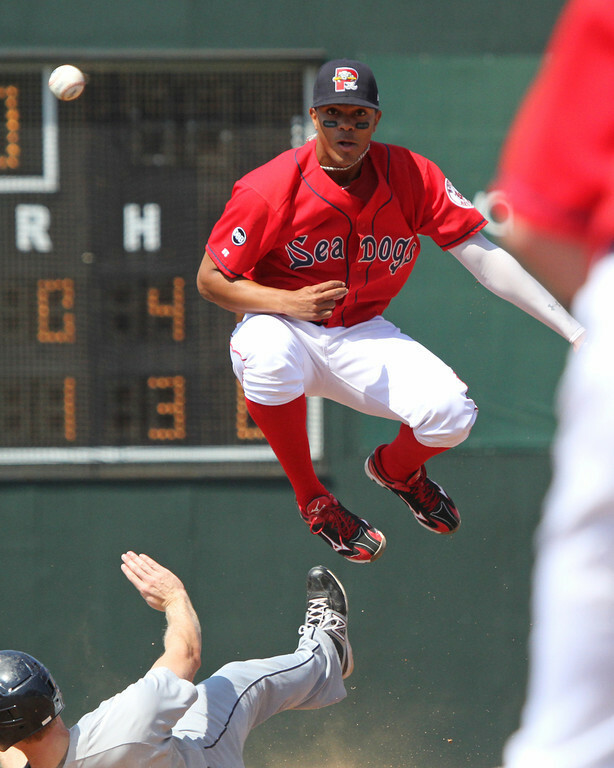 Among those at major league spring training this year are 19 non-roster invitees, headlined by prospects Xander Bogaerts (pictured), Jackie Bradley Jr., and Deven Marrero. Bogaerts will play for the Netherlands in the World Baseball Classic. He is likely to be either the designated hitter or see some time at third base, and therefore John Farrell has said he plans to get Bogaerts some reps at third before he leaves camp to prepare. However, the plan is still for Bogaerts to play shortstop exclusively for the Red Sox in the near future. Strengths: Coyle possesses a smooth, compact stroke that fluidly arrives at the point of contact. His strong hands and forearms enable him to generate above-average bat speed, along with assisting in controlling the head of the bat on a consistent plane through the strike zone. The hit tool grades as solid-average, with the ability to develop into a .280s hitter at full utility. Coyle’s hot spot is with pitches middle-in, where he pulls his hands in well and rifles the bat head through the ball. Despite being on the small side at 5-foot-8, his well-filled out base and strong core help him create torque to drive offerings with back spin, especially on the pull side. In the field, Coyle only has about average range at second, but is sure with the glove and technically sound. He anticipates the ball well at the crack of the bat and slows the game down defensively when making plays. The defense projects as about solid-average. Coyle shows a strong aptitude for the game, along with the type of makeup that pushes him to adjust and drives him to be successful. With Spring Training set to get under way, SoxProspects.com will be taking an in-depth look at many of the system's prospects with previews set for every Monday, Wednesday, and Friday leading up to Opening Day. The first installment of the series features two young arms beginning their development tracks in the lower levels of the system. Strengths: On the young side for a high school draftee entering the professional ranks, Callahan has a projectable frame that can fill out and put on good weight as he matures into his twenties. The fastball presently sits 90-92 mph, with downward movement through the strike zone when he is staying on top of the ball. Callahan’s heater has the ability to force opposing hitters to swing over the top of it and pound it into the ground due to the nature of its movement. His main secondary weapon presently is a 74-76 mph over-the-top curveball that shows both the type of depth and bite to get batters to commit to the offering early before realizing it is a breaking ball. There’s room for growth with the pitch as it has potential to round into a solid-average-to-plus pitch at his disposal as the righty matures. Because of his age and the fact that he is just learning to pitch, Callahan is the type of arm that can make big gains and take strong development strides once fully immersed in the professional ranks. While presently tough to nail down an exact path for the young pitcher, the early scouting looks showed an arm that has the overall package to track as a starting pitcher. BOSTON, Mass. 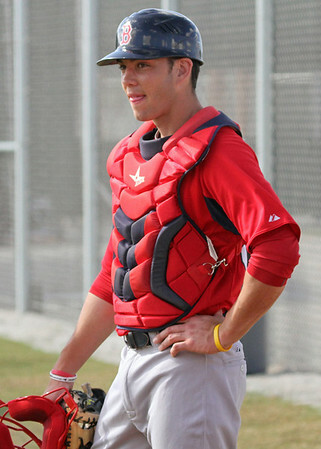 -- Garin Cecchini makes no bones about his approach to the game of baseball. As far as he's concerned, if he's not finding a way to improve on a daily basis, then he's doing something wrong. One area in which Cecchini made noticeable improvements last season in Low A Greenville was base running. The 21-year-old stole 51 bases while only being caught six times en route to winning the Red Sox Minor League Base Runner of the Year award. Grading as having just slightly above-average speed by SoxProspects.com scouts, Cecchini explained that speed is only one aspect of his success swiping bags. The Caribbean Series finished up this week with Mexico outlasting the Dominican Republic 4-3 in 18 innings to take home the title. With the offseason all-but concluded, this will be the last installment of the Winter League Roundup. Look for regular updates from Fort Myers in the coming weeks. Jose De La Torre allowed one run on one hit and a walk in his lone inning of work in Puerto Rico's 6-4 victory on on Monday. The Caribbean Series kicked off this week as the champions from the Dominican, Puerto Rican, Venezuelan and Mexican leagues faced each other. Jose De La Torre received the loss against the Dominican Republic on Saturday, tossing 1 2/3 innings, allowing one run on two hits. Oscar Villarreal hurled an inning of relief in Mexico's 3-0 over Puerto Rico Friday, allowing a hit and a walk while punching out one. On Saturday against Venezuela, Villarreal was charged with a blown save for allowing two runs on three hits in 2/3 innings of work. With only eight days until pitchers and catchers report to Fort Myers, the too-long offseason is finally drawing to a close. The Red Sox had a busy January. Beyond the much-reported completion of the Mike Napoli contract, Boston was busy adding necessary depth for the 2013 season. 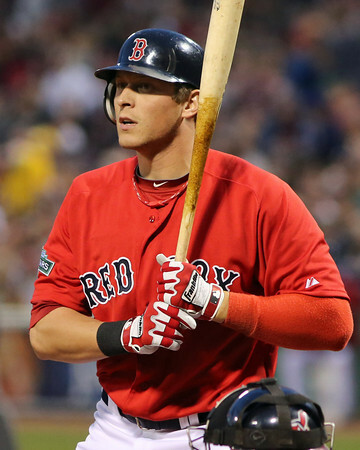 Because of Kalish's injury, the Red Sox quickly found themselves in the market for a left-handed bat off the bench. They took to the free agency to bring in a pair of major league veterans. Outfielder Ryan Sweeney (pictured) and first baseman Lyle Overbay were signed to minor league contracts, both with clauses allowing them to opt out if they do not make the major league club out of spring training. After a scorching hot first six weeks in a Red Sox uniform, Sweeney struggled badly with both injuries and performance. He appeared in only 25 games from June 1 on, hitting .157/.234/.243, and was non-tendered earlier in the offseason. Overbay is a 12-year veteran who ranks among the top 50 active players in career doubles and bases on balls. He split 2012 between Arizona and Atlanta, hitting .259/.331/.397.